In a large pot over medium-high heat, add the oil and sauté the chicken, browning on both sides. Season with salt, pepper and dashes of cumin. Remove chicken once fat has been released. Reserve. In the same pot you fried the chicken in, sauté the onion and red pepper over medium heat until the onion is translucent. Add the crushed garlic and cook an additional minute or two, stirring frequently. Return chicken to the same pot; add broth, tomato sauce, Bijol, bay leaf, oregano, cumin, salt and pepper. Add the rice, stir to coat and full submerge it. Bring to a boil and reduce heat to low. When the rice has absorbed some of the liquid, cover and simmer on low heat for about 30 to 45 minutes, or until the rice is fully cooked. Add the frozen peas during the last five minutes of cooking only. Depending on if you like your rice soupy, add more liquid (broth, water or beer). The prolonged cooking times is best suited for dark chicken meat, with skin on. In a Cuban home, nothing is more comforting than a big plate of “Arroz con Pollo”. I can recall, after a long day at high school and soccer practice, devouring more than a plate full. The savor aroma that fills your home while you cook this meal is almost as comforting as the meal itself. Every Cuban family has their special Arroz con Pollo recipe, having a preference on how soupy the end results looks like, but this basic recipe is the foundation. 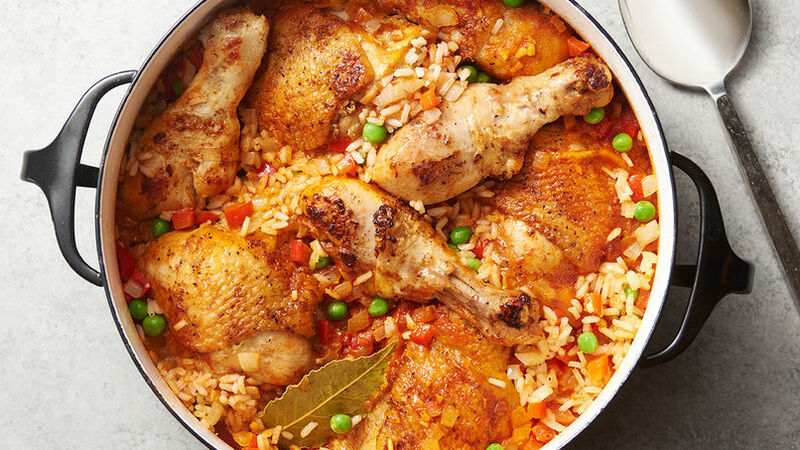 Make Arroz con Pollo for a family gathering or special party; the tastes are complex, yet the dish is easy to make. I hope you enjoy this Cuban comfort food as much as I have in my childhood, and my children do now.